Part of my food life journey is exploring all areas of the protein spectrum and, to be honest, fish was somewhat of a new frontier for me. I ordered it all the time in restaurants (and loved it) but it was an intimidating home meal. All that worrying about freshness, the higher cost and sometimes the smell didn’t exactly make it attractive. 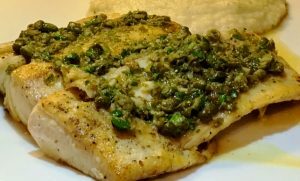 But after the past few years, I’m over all of that BS and often make a super easy fish recipe like Mahi with Lemon Caper Sauce. The secret? Buy frozen fillets and you don’t have to worry about freshness (or a fishy smell). This recipe was inspired by Cooking Light Magazine and refined through a few iterations until I made it perfect for me and my lifestyle. A fantastic weeknight meal, this super easy fish recipe comes together in about 30 minutes, tops. I serve it with roasted Brussels Sprouts with Bacon or mashed celery root and a simple salad with my go-to salad dressing. A refreshing Sauvignon Blanc or Chenin Blanc wine pairs quite nicely. 1. Place fish on plate and dry with a paper towel. On a separate plate, mix flour, salt and pepper. Dredge fish in the flour mixture. 2. Heat oil in large, non-stick or cast iron skillet over medium heat. Place fish in pan and brown on both sides, about 4 minutes each side depending on the thickness of the fillets. When done, fish should flake easily with a fork. Remove from pan and keep warm in a preheated oven. 3. Melt butter in the pan and add garlic. Cook about 1 minute or until fragrant. Add broth and be sure to scrape all the juicy bits from the bottom of the pan. Bring to a boil and reduce the broth until about 1/2 cup remains, about 4-5 minutes. Stir in lemon juice and capers and cook about 2 minutes or until sauce slightly thickens. 4. Remove from heat and stir in herbs. Serve immediately over the fish.